A plethora of economic, diplomatic, cultural, and other highly pragmatic linkages are making the “Asianisation” of Asia a reality. Davidson, demonstrates in this book how the powerful connections that are being forged by the very eastern and western extremities of the continent are poised to become a central pillar of this process. Most notably, an important new relationship is developing between the six monarchies of the Persian Gulf and the three most industrialised Asian economies. 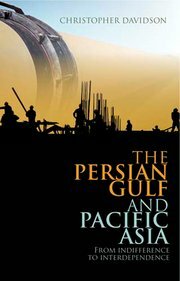 What began as a simple, twentieth century marriage of convenience based on hydrocarbon imports and exports has now evolved into a comprehensive, long-term mutual commitment that will not only continue to capitalise on the Persian Gulf’s rich energy resources and Pacific Asia’s massive energy needs, but will also seek to develop strong non-hydrocarbon bilateral trade, will facilitate sovereign wealth investments in both directions, and will provide lucrative opportunities for experienced Pacific Asian construction companies, and – in China’s case – its vast labour force. Publishers’ websites: Oxford University Press / Hurst & Co.